Cathode rays are streams of electrons observed in vacuum tubes. If an evacuated glass tube is equipped with two electrodes and a voltage is applied, glass behind the positive electrode is observed to glow, due to electrons emitted from the cathode. They were first observed in 1869 by German physicist Johann Wilhelm Hittorf, and were named in 1876 by Eugen Goldstein Kathodenstrahlen, or cathode rays. In 1897, British physicist J. J. Thomson showed that cathode rays were composed of a previously unknown negatively charged particle, which was later named the electron. Cathode ray tubes (CRTs) use a focused beam of electrons deflected by electric or magnetic fields to render an image on a screen. A Crookes tube is an early experimental electrical discharge tube, with partial vacuum, invented by English physicist William Crookes and others around 1869-1875, in which cathode rays, streams of electrons, were discovered. The earliest experimenter thought to have (unknowingly) produced X-rays was actuary William Morgan. In 1785 he presented a paper to the Royal Society of London describing the effects of passing electrical currents through a partially evacuated glass tube, producing a glow created by X-rays. This work was further explored by Humphry Davy and his assistant Michael Faraday. William Morgan, FRS was a British physician, physicist and statistician, who is considered the father of modern actuarial science. Michael Faraday FRS was an English scientist who contributed to the study of electromagnetism and electrochemistry. His main discoveries include the principles underlying electromagnetic induction, diamagnetism and electrolysis. Fernando Sanford was an American physicist and university professor. 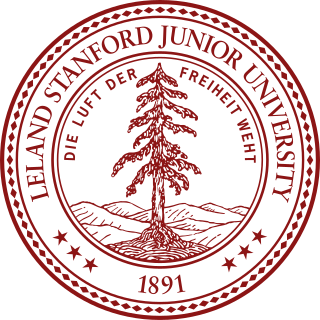 He was one of the 22 "pioneer professors" for Stanford University. Heinrich Rudolf Hertz was a German physicist who first conclusively proved the existence of the electromagnetic waves theorized by James Clerk Maxwell's electromagnetic theory of light. The unit of frequency, cycle per second, was named the "Hertz" in his honor. Philipp Eduard Anton von Lenard was a German physicist and the winner of the Nobel Prize for Physics in 1905 for his research on cathode rays and the discovery of many of their properties. Lenard was a nationalist and anti-Semite; as an active proponent of the Nazi ideology, he supported Adolf Hitler in the 1920s and was an important role model for the "Deutsche Physik" movement during the Nazi period. Notably, he labeled Albert Einstein's contributions to science as "Jewish physics". Hermann von Helmholtz formulated mathematical equations for X-rays. He postulated a dispersion theory before Röntgen made his discovery and announcement. It was formed on the basis of the electromagnetic theory of light. However, he did not work with actual X-rays. In 1894 Nikola Tesla noticed damaged film in his lab that seemed to be associated with Crookes tube experiments and began investigating this radiant energy of "invisible" kinds. After Röntgen identified the X-ray, Tesla began making X-ray images of his own using high voltages and tubes of his own design,  as well as Crookes tubes. 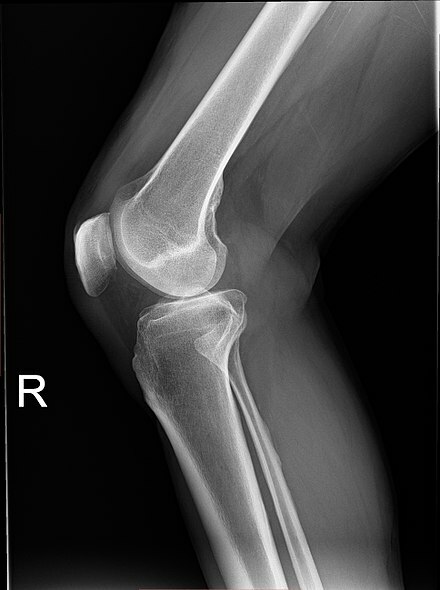 Phase-contrast X-ray imaging refers to a variety of techniques that use phase information of a coherent x-ray beam to image soft tissues. It has become an important method for visualizing cellular and histological structures in a wide range of biological and medical studies. There are several technologies being used for x-ray phase-contrast imaging, all utilizing different principles to convert phase variations in the x-rays emerging from an object into intensity variations. These include propagation-based phase contrast,  talbot interferometry,  refraction-enhanced imaging,  and x-ray interferometry. These methods provide higher contrast compared to normal absorption-contrast x-ray imaging, making it possible to see smaller details. A disadvantage is that these methods require more sophisticated equipment, such as synchrotron or microfocus x-ray sources, X-ray optics, and high resolution x-ray detectors. Attenuation length of X-rays in water showing the oxygen absorption edge at 540 eV, the energy dependence of photoabsorption, as well as a leveling off at higher photon energies due to Compton scattering. The attenuation length is about four orders of magnitude longer for hard X-rays (right half) compared to soft X-rays (left half). The probability of a photoelectric absorption per unit mass is approximately proportional to Z3/E3, where Z is the atomic number and E is the energy of the incident photon. This rule is not valid close to inner shell electron binding energies where there are abrupt changes in interaction probability, so called absorption edges. However, the general trend of high absorption coefficients and thus short penetration depths for low photon energies and high atomic numbers is very strong. For soft tissue, photoabsorption dominates up to about 26 keV photon energy where Compton scattering takes over. For higher atomic number substances this limit is higher. The high amount of calcium (Z=20) in bones together with their high density is what makes them show up so clearly on medical radiographs. Compton scattering is the predominant interaction between X-rays and soft tissue in medical imaging. Compton scattering is an inelastic scattering of the X-ray photon by an outer shell electron. Part of the energy of the photon is transferred to the scattering electron, thereby ionizing the atom and increasing the wavelength of the X-ray. The scattered photon can go in any direction, but a direction similar to the original direction is more likely, especially for high-energy X-rays. The probability for different scattering angles are described by the Klein–Nishina formula. The transferred energy can be directly obtained from the scattering angle from the conservation of energy and momentum. Spectrum of the X-rays emitted by an X-ray tube with a rhodium target, operated at 60 kV. The smooth, continuous curve is due to bremsstrahlung , and the spikes are characteristic K lines for rhodium atoms. X-rays can be generated by an X-ray tube, a vacuum tube that uses a high voltage to accelerate the electrons released by a hot cathode to a high velocity. The high velocity electrons collide with a metal target, the anode, creating the X-rays. In medical X-ray tubes the target is usually tungsten or a more crack-resistant alloy of rhenium (5%) and tungsten (95%), but sometimes molybdenum for more specialized applications, such as when softer X-rays are needed as in mammography. In crystallography, a copper target is most common, with cobalt often being used when fluorescence from iron content in the sample might otherwise present a problem. Bremsstrahlung : This is radiation given off by the electrons as they are scattered by the strong electric field near the high-Z (proton number) nuclei. These X-rays have a continuous spectrum. The intensity of the X-rays increases linearly with decreasing frequency, from zero at the energy of the incident electrons, the voltage on the X-ray tube. X-rays can also be produced by fast protons or other positive ions. The proton-induced X-ray emission or particle-induced X-ray emission is widely used as an analytical procedure. For high energies, the production cross section is proportional to Z12Z2−4, where Z1 refers to the atomic number of the ion, Z2 to that of the target atom. An overview of these cross sections is given in the same reference. Computed tomography (CT scanning) is a medical imaging modality where tomographic images or slices of specific areas of the body are obtained from a large series of two-dimensional X-ray images taken in different directions. These cross-sectional images can be combined into a three-dimensional image of the inside of the body and used for diagnostic and therapeutic purposes in various medical disciplines. Experimental and epidemiological data currently do not support the proposition that there is a threshold dose of radiation below which there is no increased risk of cancer. However, this is under increasing doubt. It is estimated that the additional radiation from diagnostic X-rays will increase the average person's cumulative risk of getting cancer by age 75 by 0.6–3.0%. 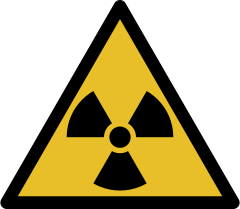 The amount of absorbed radiation depends upon the type of X-ray test and the body part involved. CT and fluoroscopy entail higher doses of radiation than do plain X-rays. X-ray crystallography in which the pattern produced by the diffraction of X-rays through the closely spaced lattice of atoms in a crystal is recorded and then analysed to reveal the nature of that lattice. In the early 1990s, experiments were done in which layers a few atoms thick of two different materials were deposited in a Thue-Morse sequence. The resulting object was found to yield X-ray diffraction patterns. A related technique, fiber diffraction, was used by Rosalind Franklin to discover the double helical structure of DNA. X-ray astronomy, which is an observational branch of astronomy, which deals with the study of X-ray emission from celestial objects. X-ray microscopic analysis, which uses electromagnetic radiation in the soft X-ray band to produce images of very small objects. 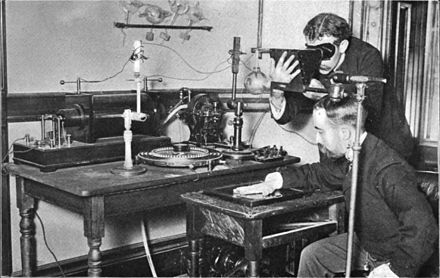 X-ray fluorescence, a technique in which X-rays are generated within a specimen and detected. The outgoing energy of the X-ray can be used to identify the composition of the sample. Industrial radiography uses X-rays for inspection of industrial parts, particularly welds. Authentication and quality control, X-ray is used for authentication and quality control of packaged items. Industrial CT (computed tomography) is a process which uses X-ray equipment to produce three-dimensional representations of components both externally and internally. This is accomplished through computer processing of projection images of the scanned object in many directions. Paintings are often X-rayed to reveal underdrawings and pentimenti, alterations in the course of painting or by later restorers. Many pigments such as lead white show well in radiographs. X-ray spectromicroscopy has been used to analyse the reactions of pigments in paintings. For example, in analysing colour degradation in the paintings of van Gogh  . Airport security luggage scanners use X-rays for inspecting the interior of luggage for security threats before loading on aircraft. Border control truck scanners use X-rays for inspecting the interior of trucks. X-ray art and fine art photography, artistic use of X-rays, for example the works by Stane Jagodič X-ray hair removal, a method popular in the 1920s but now banned by the FDA. Shoe-fitting fluoroscopes were popularized in the 1920s, banned in the US in the 1960s, banned in the UK in the 1970s, and even later in continental Europe. Roentgen stereophotogrammetry is used to track movement of bones based on the implantation of markers X-ray photoelectron spectroscopy is a chemical analysis technique relying on the photoelectric effect, usually employed in surface science. Radiation implosion is the use of high energy X-rays generated from a fission explosion (an A-bomb) to compress nuclear fuel to the point of fusion ignition (an H-bomb). While generally considered invisible to the human eye, in special circumstances X-rays can be visible. Brandes, in an experiment a short time after Röntgen's landmark 1895 paper, reported after dark adaptation and placing his eye close to an X-ray tube, seeing a faint "blue-gray" glow which seemed to originate within the eye itself. Upon hearing this, Röntgen reviewed his record books and found he too had seen the effect. When placing an X-ray tube on the opposite side of a wooden door Röntgen had noted the same blue glow, seeming to emanate from the eye itself, but thought his observations to be spurious because he only saw the effect when he used one type of tube. Later he realized that the tube which had created the effect was the only one powerful enough to make the glow plainly visible and the experiment was thereafter readily repeatable. The knowledge that X-rays are actually faintly visible to the dark-adapted naked eye has largely been forgotten today; this is probably due to the desire not to repeat what would now be seen as a recklessly dangerous and potentially harmful experiment with ionizing radiation. It is not known what exact mechanism in the eye produces the visibility: it could be due to conventional detection (excitation of rhodopsin molecules in the retina), direct excitation of retinal nerve cells, or secondary detection via, for instance, X-ray induction of phosphorescence in the eyeball with conventional retinal detection of the secondarily produced visible light. A CT scan, also known as computed tomography scan, and formerly known as a computerized axial tomography scan or CAT scan, makes use of computer-processed combinations of many X-ray measurements taken from different angles to produce cross-sectional (tomographic) images of specific areas of a scanned object, allowing the user to see inside the object without cutting. An X-ray generator is a device that produces X-rays. Together with an X-ray detector, it is commonly used in a variety of applications including medicine, fluorescence, electronic assembly inspection, and measurement of material thickness in manufacturing operations. In medical applications, X-ray generators are used by radiographers to acquire x-ray images of the internal structures of living organisms, and also in sterilization. External beam radiotherapy (EBRT) is the most common form of radiotherapy. The patient sits or lies on a couch and an external source of ionizing radiation is pointed at a particular part of the body. In contrast to brachytherapy and unsealed source radiotherapy, in which the radiation source is inside the body, external beam radiotherapy directs the radiation at the tumour from outside the body. Orthovoltage ("superficial") X-rays are used for treating skin cancer and superficial structures. Megavoltage X-rays are used to treat deep-seated tumours, whereas megavoltage electron beams are typically used to treat superficial lesions extending to a depth of approximately 5 cm. X-rays and electron beams are by far the most widely used sources for external beam radiotherapy. A small number of centers operate experimental and pilot programs employing beams of heavier particles, particularly protons, owing to the rapid dropoff in absorbed dose beneath the depth of the target. The gray is a derived unit of ionizing radiation dose in the International System of Units (SI). It is defined as the absorption of one joule of radiation energy per kilogram of matter. 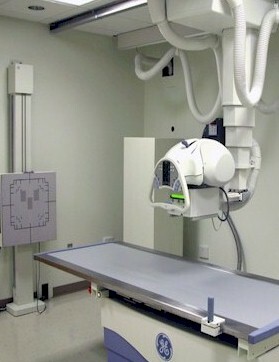 Fluoroscopy is an imaging technique that uses X-rays to obtain real-time moving images of the interior of an object. In its primary application of medical imaging, a fluoroscope allows a physician to see the internal structure and function of a patient, so that the pumping action of the heart or the motion of swallowing, for example, can be watched. This is useful for both diagnosis and therapy and occurs in general radiology, interventional radiology, and image-guided surgery. In its simplest form, a fluoroscope consists of an X-ray source and a fluorescent screen, between which a patient is placed. However, since the 1950s most fluoroscopes have included X-ray image intensifiers and cameras as well, to improve the image's visibility and make it available on a remote display screen. For many decades fluoroscopy tended to produce live pictures that were not recorded, but since the 1960s, as technology improved, recording and playback became the norm. An x-ray image intensifier (XRII) is an image intensifier that converts x-rays into visible light at higher intensity than the more traditional fluorescent screens can. Such intensifiers are used in x-ray imaging systems to allow low-intensity x-rays to be converted to a conveniently bright visible light output. The device contains a low absorbency/scatter input window, typically aluminum, input fluorescent screen, photocathode, electron optics, output fluorescent screen and output window. These parts are all mounted in a high vacuum environment within glass or more recently, metal/ceramic. By its intensifying effect, It allows the viewer to more easily see the structure of the object being imaged than fluorescent screens alone, whose images are dim. The XRII requires lower absorbed doses due to more efficient conversion of x-ray quanta to visible light. This device was originally introduced in 1948. Peak kilovoltage (kVp) refers to the maximum high voltage applied across an X-ray tube during the creation of x-rays within it. During x-ray generation, surface electrons are released from a heated cathode by thermionic emission. The applied voltage (kV) accelerates these electrons toward an anode target, ultimately producing x-rays when the electrons are stopped in the anode. Thus, the kVp corresponds to the highest kinetic energy of the electrons striking the target, and is proportional to the maximum energy of the resulting X-ray emission spectrum. In early and basic x-ray equipment, the applied voltage varies cyclically, with one, two, or more pulses per mains AC power cycle. One standard way to measure pulsating DC is its peak amplitude, hence kVp. Most modern X-ray generators apply a constant potential across the x-ray tube; in such systems, the kVp and the steady-state kV are identical. Photostimulated luminescence (PSL) is the release of stored energy within a phosphor by stimulation with visible light, to produce a luminescent signal. X-rays may induce such an energy storage. A plate based on this mechanism is called a photostimulable phosphor (PSP) plate and is one type of X-ray detector used in projectional radiography. Creating an image requires illuminating the plate twice: the first exposure, to the radiation of interest, "writes" the image, and a later, second illumination "reads" the image. 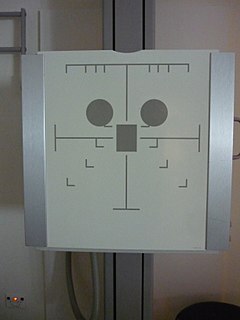 The device to read such a plate is known as a phosphorimager. X-ray detectors are devices used to measure the flux, spatial distribution, spectrum, and/or other properties of X-rays. ↑ From his technical publications, it is indicated that he invented and developed a special single-electrode X-ray tube: Morton, William James and Hammer, Edwin W. (1896) American Technical Book Co., p. 68., U.S. Patent 514,170 , "Incandescent Electric Light", and U.S. Patent 454,622 "System of Electric Lighting". These differed from other X-ray tubes in having no target electrode and worked with the output of a Tesla Coil. ↑ Stanton, Arthur (1896-01-23). "Wilhelm Conrad Röntgen On a New Kind of Rays: translation of a paper read before the Würzburg Physical and Medical Society, 1895". Nature . 53 (1369): 274–6. Bibcode:1896Natur..53R.274.. doi:10.1038/053274b0. see also pp. 268 and 276 of the same issue. ↑ Arthur, Charles. "Google doodle celebrates 115 years of X-rays". TheGuardian. Guardian US. Retrieved 5 February 2019. ↑ Sample, Sharro (2007-03-27). "X-Rays". The Electromagnetic Spectrum. NASA . Retrieved 2007-12-03. ↑ Markel, Howard (20 December 2012). "'I Have Seen My Death': How the World Discovered the X-Ray". PBS NewsHour. PBS. Retrieved 23 March 2019. ↑ Camara, C. G.; Escobar, J. V.; Hird, J. R.; Putterman, S. J. (2008). "Correlation between nanosecond X-ray flashes and stick–slip friction in peeling tape" (PDF). Nature. 455 (7216): 1089–1092. Bibcode:2008Natur.455.1089C. doi:10.1038/nature07378 . Retrieved 2 February 2013. ↑ Köhn, Christoph; Ebert, Ute (2014). "Angular distribution of Bremsstrahlung photons and of positrons for calculations of terrestrial gamma-ray flashes and positron beams". Atmospheric Research. 135-136: 432–465. arXiv: 1202.4879 . doi:10.1016/j.atmosres.2013.03.012. ↑ Köhn, C; Chanrion, O; Neubert, T (2017). "Electron acceleration during streamer collisions in air". Geophysical Research Letters. 44 (5): 2604–2613. doi:10.1002/2016GL072216. PMC 5405581 . PMID 28503005. ↑ Köhn, C; Chanrion, O; Neubert, T (2018). "High-Energy Emissions Induced by Air Density Fluctuations of Discharges". Geophysical Research Letters. 45 (10): 5194–5203. doi:10.1029/2018GL077788. PMC 6049893 . PMID 30034044. ↑ "11th Report on Carcinogens". Ntp.niehs.nih.gov. Archived from the original on 2010-12-09. Retrieved 2010-11-08. ↑ X-Rays Archived 2007-03-15 at the Wayback Machine . Doctorspiller.com (2007-05-09). Retrieved on 2011-05-05. ↑ X-Ray Safety Archived April 4, 2007, at the Wayback Machine . Dentalgentlecare.com (2008-02-06). Retrieved on 2011-05-05. ↑ Wolfram, Stephen (2002). A New Kind of Science. Champaign, Illinois: Wolfram Media, Inc. p. 586. ISBN 978-1579550080 . Retrieved 15 March 2018. ↑ Ahi, Kiarash (May 26, 2016). "Advanced terahertz techniques for quality control and counterfeit detection". Proc. SPIE 9856, Terahertz Physics, Devices, and Systems X: Advanced Applications in Industry and Defense, 98560G. Terahertz Physics, Devices, and Systems X: Advanced Applications in Industry and Defense. 9856: 98560G. Bibcode:2016SPIE.9856E..0GA. doi:10.1117/12.2228684 . Retrieved May 26, 2016. ↑ Als-Nielsen, Jens; Mcmorrow, Des (2001). Elements of Modern X-Ray Physics. John Wiley & Sons Ltd. pp. 40–41. ISBN 978-0-471-49858-2. Wikimedia Commons has media related to X-ray .